FFC is a weekly event created by Ryan at Wordsmithonia. Ayla from The Clan of the Cave Bear and the entire Earth's Children series by Jean M. Auel. If Ayla were a real historical figure, she might have been the first woman in history to stand for women's liberation. And though she is a fictional character, I like to think that there really was an Ayla in prehistoric times who dared to stand up for a woman's right, and ability, to accomplish anything a man could. Ayla is not a Neanderthal, but a Cro-Magnon, and when she is taken in by the "clan", she is not readily accepted--by some less than others. When her totem (an animal spirit guide) is determined to be a cave lion--a particularly strong totem for a woman--Ayla is seen as even more of a threat. When she picks up a weapon, a rock sling, and learns to use it as well, or even better, than the men, she is severely punished for breaking the clan law of women being forbidden to wield weapons. 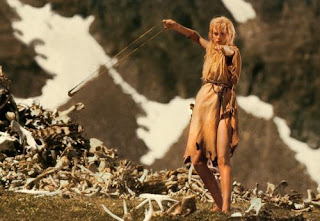 Now you can see why I think Ayla is the prehistoric poster child for women's liberation! On a side note, I will say that I think the use of the stronger cave lion totem for Ayla was the author's way of using symbolism to show that "the others" (Cro-Magnons) were stronger and superior to the Neanderthal. This is something that we, of course, now know to be true because the Cro-Magnons prevailed and the Neanderthal died off. However, it has been proven more recently that the Neanderthal were not quite as inferior to us as originally believed. Whether they did indeed die out or assimilated with Cro-Magnons is still yet to be proven. If you have not read this book, I highly recommend it. I was just looking for any hint of the next book coming out the other day! Auel seems to take forever to write each book. Hopefully we will get to read the end of the series. She sounds like one strong woman! Nice profile! I read this book as a teenager as well. Such a great book! I started Valley of the Horses (which I think is the second one in this series, but got interrupted. I enjoyed this book and series though I do think Ayla was just a little bit too perfect as there was nothing she couldn't do. Ayla kicked a$$, didn't she? By the time the fifth book came out though, her being able to solve every single problem by creating something new and fabulous got a little old. But she is perfect for showing that women can survive and even thrive in a man's world. This sounds like an amazing character! After reading this I may have to look into the book. Thanks for picking such a wonderful character this week! I remember loving this series when I read it as a teenager. I read this post earlier but I forgot to comment, please forgive me. She sounds like a wonderful character, thank you for posting about her since I haven't seen the movie or read the book.